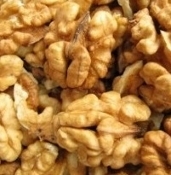 Organic Raw Walnuts - Halves and Pieces 2lbs. Certified Organic Walnuts from the top walnut producing county in California. Walnuts, like all tree nuts, are a great source of healthful vegetarian fat and protein, improving cholesterol status and preventing heart attacks. Eating Nuts also helps you lose weight by increasing satiety, thereby helping lessen consumption of carbohydrate-rich, appetitie-stimulating, calorie laden foods.